Knowing what little I know about what makes planes fly, I felt myself laughing at the silly notion of first flight being achieved by a giant clumsy bird-thing. 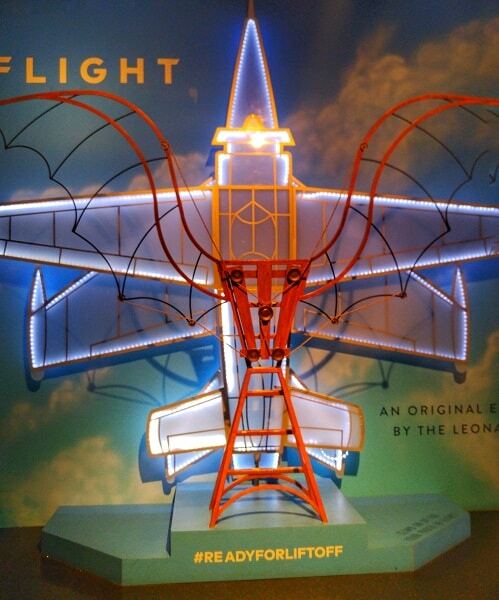 I recently had a chance to explore the FLIGHT Exhibit at the Leonardo Museum in Salt Lake City, Utah. As we walked down the streets of Salt Lake City, Utah, the snow clustered like Styrofoam beads in the cracks of sidewalks and pressed itself against the window sills of coffee shops and rare book stores. The wall of wet concrete colored clouds blocked the mountains of staggering height surrounding the city, a sight I would only catch a glimpse of twice during my stay. 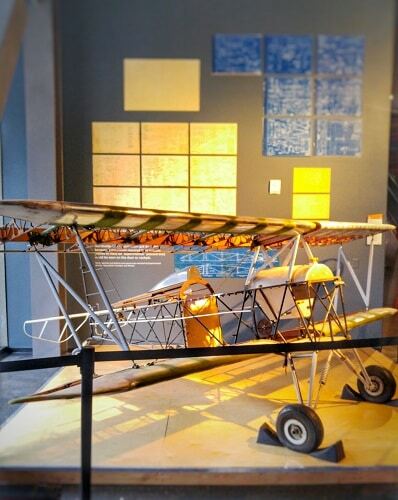 Our small crew of aviation enthusiasts and writers for Disciples of Flight decided to put down our laptops and notepads and visit the FLIGHT exhibit at The Leonardo, a renowned SLC museum, for a little hands-on education. The lack of car traffic and the distance we put between the homeless man loudly living out his delusion of becoming a running back for the NFL, combined with the juxtaposition of the ultra-modern architecture stacked beside the intricate and barbed towers of the ancient churches and law buildings gave the chilly walk a feeling of something completely outside of reality. Nothing but the occasional eccentric pedestrian and the bumping of shoulders could lift the veil. Until we crossed the threshold of The Leonardo, that is. We entered the contemporary white-stone entryway and were greeted by a young woman with a messy bun of dark hair gathered atop her head and a golden septum ring hanging from her nose. We chatted while we got our hands stamped for the exhibit, and I tied my jean jacket around my waist and put my phone into camera mode. I was ready and willing to get my mind blown by the wonders of flight! A close up on the Dream Tunnel. 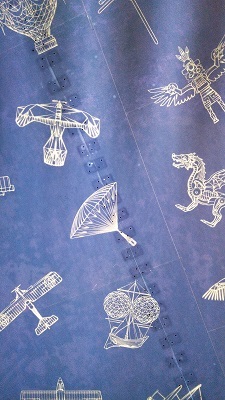 The museum was dark, and we encountered the first exhibit in the form of a dream tunnel; a wide-mouthed tunnel painted blueprint-blue and decorated by simple white images of every flight-related machine, deity, or hopeful sketch found throughout history, which seemed to glow almost from within. One of my companions, a WWII aviation history buff, was giddy with excitement pointing out the various German and Japanese fighter planes skimming the curved walls. Leonardo Da Vinci’s flying machines gave the tunnel a sense of whimsy, while the severe Native American eagle gods reminded me how universal and terrifying this timeless fascination with flight truly is. The tunnel narrowed as we continued, and deposited us into a huge dark room, illuminated only by hanging bulbs when the displays called for it. The dream abruptly ended when our solitude was interrupted by what can only be described as a cacophony of unattended children. I could almost see the sugary cereals vibrating through their bloodstreams. It was horrifying. It appeared they must have arrived right before we did, so we were able to watch the devolution of humanity as their organized lines dissolved into swarms that reminded me of cockroaches surprised by the sudden appearance of light. Their lanyard-wearing teachers held clipboards and occasionally would squawk in the children’s direction in some disturbing caricature of control before turning back to their phones. Our party exchanged a worried glance, and an unspoken resignation cumulated in a series of deep breaths. 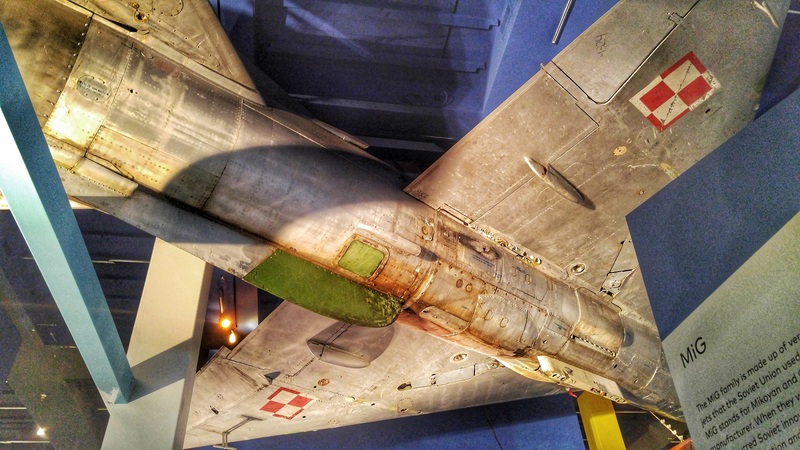 We were determined to enjoy and learn from this exhibit, though I have to admit – if there weren’t giant airplanes hanging from the ceiling with one that you could walk inside, my determination wouldn’t have been able to drive my body forward. I worked in customer service and the food industry for long enough to understand why parents occasionally refer to children as “terrors” and felt reluctant to surround myself with that unwanted stress once again. Regardless, we trudged onward and headed up the stairs that promised entry into the cockpit of the C-131, a twin-engine military transport plane used in the mid-1950’s. The plane was raw aluminum, and the interior was completely gutted, with the exception of the cockpit, which was illuminated with an eerie blue-green light. The cockpit of the Convair 131 Samaritan was home to so many switches and buttons that I couldn’t believe anyone could actually memorize what they all do. A very artsy representation of the evolution of flight at the start of the flight exhibit. I had my two companions sit in the cockpit and “try and fly the thing,” but apparently being the subjects of candid photography wasn’t their strong point, and they locked on to the camera with grins plastered on. Regardless, the flood of children could be heard rushing up the aluminum steps to the fuselage, filling each and every one of us with an unspeakable terror. As we quickly turned toward the escape, we could feel the glares of the munchkins on our backs as we apparently didn’t move as fast as they wanted toward the stairs. In our hurry, we went out the wrong side of the fuselage, leaving us stranded on an overlook with no way of escape. As we waited for them to become focused on the cockpit, we sprinted towards the exit in a synchronized movement, unfortunately missing the fact that there was a giant slide built into the body of the plane, which would have been an excellent escape route and a lot of fun. Regardless, we made our way safely downstairs, narrowly escaping what might have been our undoing at the sticky fingers of elementary school monsters. After we touched down, our collective attentions scattered, and I headed towards a giant wall which was home to a brilliant quote I used in an aviation article not too long ago, before an airplane video projected on a nearby wall caught my attention. Before a few rows of empty airline seats (foldable trays, seatbelts and all), a short, soundless video about aviators who almost achieved flight was playing, apparently as some sort of comic relief. I plopped my stuff down and knelt behind the rows of chairs to take some photos of the screen, before getting distracted by the dozens and dozens of ornithopters I was watching flap and fall off the edges of barns and homemade ramps. Knowing what little I know about what makes planes fly, I felt myself laughing at the silly notion of first flight being achieved by a giant clumsy bird-thing. It’s not aerodynamic, I thought, it doesn’t have enough power, it doesn’t have any of the things I think make a plane get off the ground! What were they thinking? And then I stopped myself. It’s only natural that man should look to nature for inspiration. It had never been done before; they had no Sporty’s pilot training telling them about ground effect and the four forces, and yet, birds flew, so it was worth a shot! With this new perspective, I found myself drawn into to the silent, grainy films from another era, another world really, and though the little documentary was literally called, “Aviators Who Almost Made It,” I found myself rooting for those wonderful, determined inventors who had a dream to fly despite the odds. With everything in the world telling them they couldn’t do it, they tried anyway. Again and again they fell, and again and again, they got up. 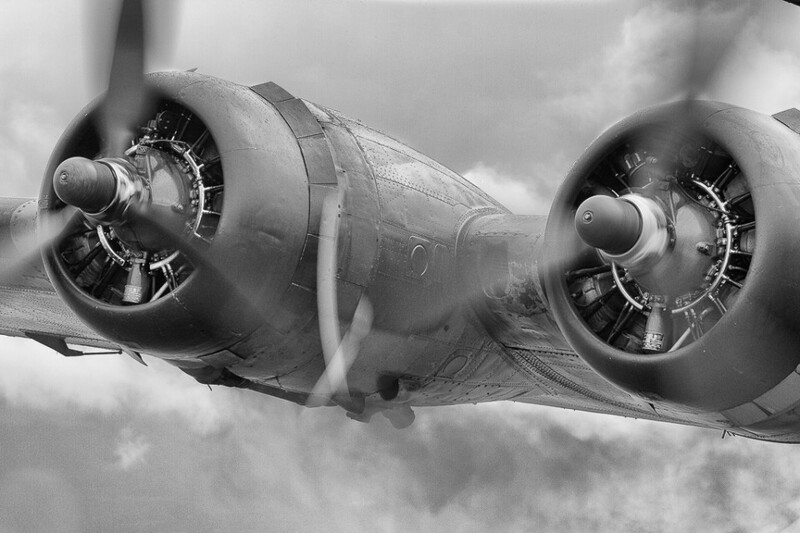 These failed aviators, these dreamers, were truly the lifeblood of the golden age of aviation. That being said, I’d be lying if I say a few giggles didn’t slip out now and again. Directly behind that exhibit, there were cross-sections of wings made of different materials, and how they shape of the wing could trade speed for lift, or vice versa. They even included some wonky-shaped thing that had no lift and no speed, for whatever reason. 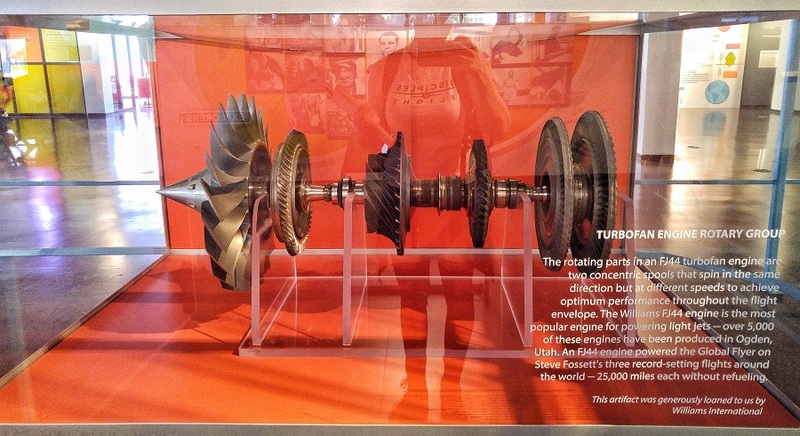 This exhibit, though on the opposite side of the museum, came in handy when I stumbled across my companions fiddling with a hands-on wing shaping machine. The exhibit looked like an arcade game mixed with a fish tank, but instead of fish, there was a wire mesh oval fixed on a metal pole that you could change the shape of by twisting knobs on the outside of the tank. 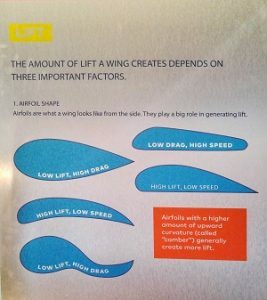 The goal of the exhibit was to help people actually understand why certain shaped wings created lift, instead of just memorizing some snippet on a poster, which I think really helped lock that information in. When it was my turn, I referenced my mental picture of the poster and created a high-lift shape that carried the wing on the upward breeze towards the top of the tank. I would have loved to try and create a maximum lift, maximum speed wing shape, but unfortunately, the exhibit didn’t have any lateral breezes that would allow me to test it. We got our fill of that flight exhibit, and again our little group dissolved. I split off and headed towards this giant backlit wall that had dissected an airplane engine and displayed it artistically to show all the little parts most people (most pilots, for that matter) may never even know existed! I didn’t gain much from the exhibit, other than a very cool background for my computer, but it was fun to look at. Next, my eyes locked onto the sonic boom exhibit. I scurried over in the direction of the aviation headsets left hanging carelessly by the little creatures running around masquerading as children, dodging a couple on my way. It’s amazing how children have absolutely zero spatial awareness. Or maybe they just don’t care if they knock people over? Whatever the case may be, I eventually threaded my way through the battlefield of shouting and running kids and their disinterested supervisors and grabbed a headset. I lifted it onto my head and closed my eyes, surrounding myself in the engine roar and unintelligible radio chatter. 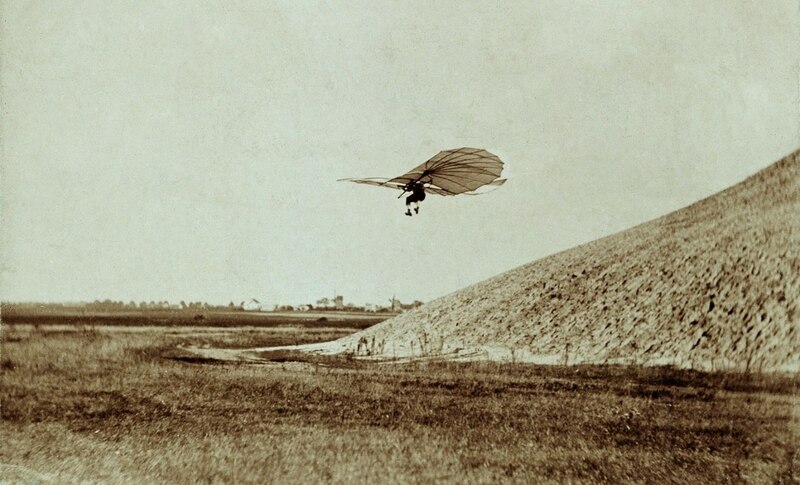 The roar slowly grew louder and more hoarse until a dampened boom rocketed through the headset, followed by the cheers of the pilots in the cockpit. 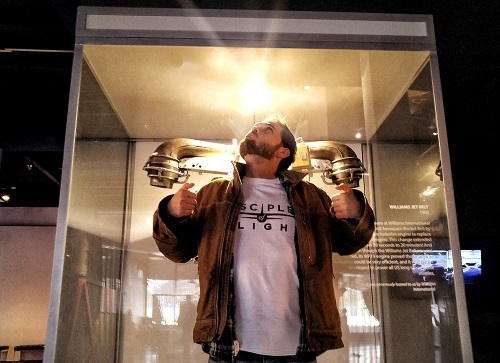 I found myself smiling along with the jubilant crew before my attention was again diverted to another exhibit that drew me in like a tractor beam: a jet pack. 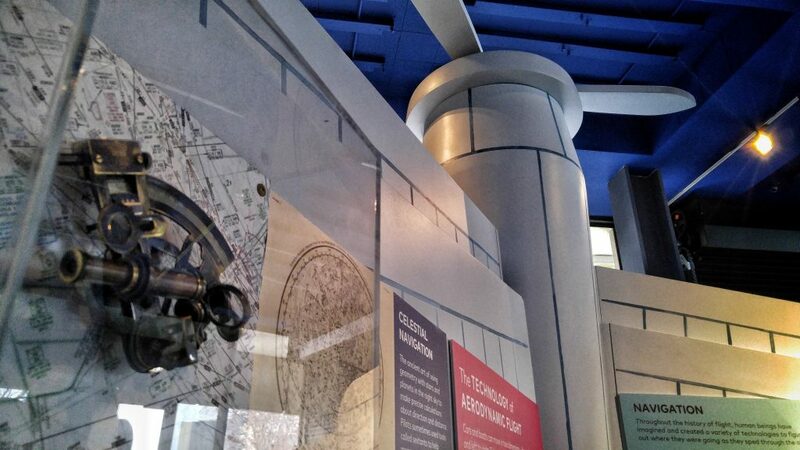 Confined to a giant glass box, the ancient-looking jet pack stood proudly like a diamond in a jewelers case. Naturally, this is where I would find my companions. As much as all pilots love planes, the idea of being exposed to the elements, tearing through the sky with the wind ruffling your hair, is something straight out of a dream. We took turns pressing our noses to the glass like children outside a toy store, reading the description mounted on the plaque, and trying to take pictures that made it look like we were wearing the jet pack. Above the exhibits, there was an abstract work of art containing feathers and tiny, hollow bird wings woven together in a papier-mâché/macramé work of pure imagination. Tiny lights twinkled within the dangling designs, giving the whole dimly-lit room a feeling of ethereal grace, despite the chaos crashing below. I decided to ride the escalator upwards to get a closer look at the delicate representation of flight. I turned my eyes skyward and watched as the dangling feathers and lights grew closer and brighter against the darkness in my peripherals, appreciating the moment of not silence, but temporary quiet as I rose farther away from the children below. Unfortunately, my focus was disrupted as I heard the wave of discordant sound rise to a crescendo behind me. I guess I wasn’t the only one interested in the escalators. Frus·tra·tion: frəˈstrāSH(ə)n/ noun; the feeling of being upset or annoyed. If I had rolled my eyes any harder, I think I might have sprained something. Shaking my head and squinting my eyes in a vaudevillian display of disapproval, I continued onwards to pop my head into the other exhibit. I scanned the photographs on the wall, each in pairs showing the child, and where they sleep. Artistic I suppose, but not really my cup of tea. I was about to turn and head back down the escalator to make my video when a sporadic movement caught my eye. A towheaded child was lying on his side on the floor, using his shoulder as a pivot and his legs as a propeller, spinning himself in circles like some pathetic break-dance school dropout. Whether general disgust or actual vertigo, I’ll never know, but I found I couldn’t look away. It was like watching a train wreck. I tried to catch the eye of his caretaker (a bored woman with a lanyard and a clipboard, glued to her phone), but her lack of caring was palpable even from the other side of the room. Again, I shook my head, and with a deep sigh, headed back toward the escalator. As soon as I turned around, I saw something that made a vein in my forehead stand at attention. There was a flock of unsupervised monsters blocking the escalator. Most of them scattered as I approached, but one remained, spreading his arms between both handrails, literally blocking the entire thing. “Excuse me?” I asked, trying to sound nice-ish. My eye may have twitched a little, but I made it onto the escalator and whipped out my phone. I was able to record a beautiful video of the ceiling display, but unfortunately, the soundtrack was less than calming. I recommend turning off or down the sound if you decide to watch it. I made a beeline to the café, figuring a little quiet would do wonders for my blood pressure. Luckily, I wasn’t the only one with that idea, and I met up with one of my other companions, the WWII plane aficionado. We sat and commiserated over coffee and snacks, and I pulled out my notebook to capture some of the best moments of the trip. I found myself unable to recall anything, I was so annoyed with the teachers and their blatant disregard for the other (paying) patrons of the museum. Then I realized I sounded like the old woman on her porch with a shotgun and a broom, yelling for kids to “git off o’ my lawn!” I shook my head, reminded myself that I’m too damn young to feel this way, and after a few deep breaths I was able to remember the wonder and awe I felt only a half hour before. I stared into the rippling black surface of my steaming coffee and found the joy I felt when the wheels on the Cessna 172m training plane detached from the asphalt, or when I watched the clouds turn salmon above the alpenglow from the sky on a late afternoon flight. There’s something indescribably majestic about flight and the human determination and stubbornness that gave us our wings. I decided I would no longer let annoyance rob me of that beauty. Walls covered in aviation quotes, plastered with the images of those who came before, the aviators who paved the way for us to take to the skies, being able to touch swaths of the very fabric protecting the first planes and pilots… it was all inspiring beyond words. I felt so incredibly lucky to have fallen into the breathtaking world of aviation. Each moment I felt myself step further and deeper into the collective heart of pilots: past, present, future. I reveled in the centuries of progress leading up to the moment I sat there, still in a sea of swarming youngsters, feeling the waves of light wash over me as I contemplated how wonderful it was to be human. 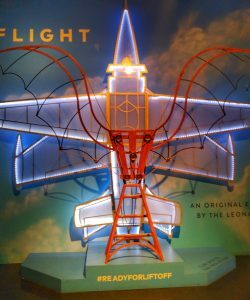 If you’d like to visit the Flight Exhibit at the Leonardo in Salt Lake City, adult tickets are $12.95 and it’s open from 10 AM to 5 PM on weekdays. I recommend giving them a call to make sure no field trips are scheduled prior to your visit! More information can be found on the Leonardo’s website. The little biplane that is captioned “One of the first ever training planes” is actually a Baby Great Lakes homebuilt airplane, designed by Barney Oldfield in the early 1960s. It only has one seat, and therefore cannot be used as a training plane. This particular exhibit is used, with the assistance of volunteers, to allow patrons age 12 and up to remove and re-install the wings, just to show how it is done.